With the rising popularity of hemp derived CBD products, the number of choices and options for consumers can seem overwhelming at times. This article aims to shed some light on one of the key variables to help demystify the terminology of “spectrums” surrounding these hemp products. You may have heard the terms full-spectrum, isolate, non-isolate and broad spectrum thrown around, but many customers don’t fully understand the significance of these descriptors. The meaning of these variations is an important factor in choosing the hemp or cannabis product that is right for you. The spectrum being described by these terms refers to the molecules derived from the hemp plant known as cannabinoids. 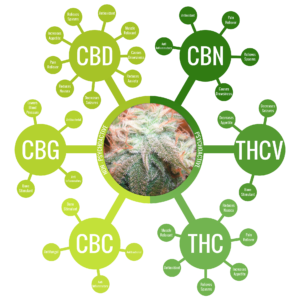 While there are more than 100 known cannabinoids identified in hemp and cannabis plants, the spectrum which is most often analyzed and discussed focuses on a more narrow range of typically 10 cannabinoids. These plant molecules, also known more specifically as phytocannabinoids, interact with the human endocannabinoid system (ECS). The human endocannabinoid system is one of the most important discoveries in recent medical history and it has been found to regulate multiple critical functions in the human brain and body. 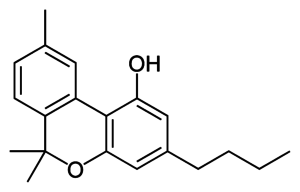 The interaction of the exogenous phytocannabinoids with receptors of the internal ECS help balance and regulate any potential deficiency or excess of naturally occurring endocannabinoids (endogenous neurotransmitters such as anandamide & 2-AG) to promote homeostasis within the human brain and body. This interaction is a key reason why so many individuals experience benefits from hemp derived products across a wide range of issues. When it comes to hemp derived products the key molecule to discuss is Cannabidiol – commonly referred to as CBD. CBD Isolate refers to a single molecule product where the Cannabidiol molecule is extracted from the plant to remove all of the other cannabinoids and plant material to produce a white, crystalline powder that is as high as 99.9% pure CBD. This crystallized powder is then formulated into various products including gummies, tinctures, edibles, topicals and more. Benefits of CBD Isolate include rapid absorption, consistent and accurate dosing and shelf life stability. Full Spectrum CBD Oil usually refers to oil that contains a wide range of cannabinoids and plant molecules. Full-spectrum CBD Oil will typically contain anywhere from 15% to as high as 80% cannabidiol with smaller percentages of other cannabinoids such as CBN (Cannabinol), CBG (Cannabigerol), CBC (Cannabichromene) and THC (Tetrahydrocannabinol). Many users find Full-Spectrum Oil to be more beneficial since there are multiple cannabinoids working together with plant molecules such as chlorophyll, vitamins and terpenes to produce synergistic effects commonly referred to as the “Entourage Effect”. Since each person’s biochemistry is unique, a wider range of cannabinoids can potentially offer a better potential outcome for a larger number of users. To be legally defined as Hemp, the levels of delta-9 THC must be not more than 0.3% according to the 2018 Farm Bill legislation. Similar to CBD Isolate, the full-spectrum extract is formulated into various products such as tinctures, vape cartridges and topicals. A new terminology has emerged recently to describe a distillate oil that falls somewhere in between isolate and full spectrum, which is called Broad Spectrum CBD Oil. Broad Spectrum CBD Oil is similar to Full Spectrum, but it is further refined to remove the THC below detectable levels while keeping the other beneficial cannabinoids in the oil. Broad Spectrum CBD oil typically contains somewhere between 70% to 90% Cannabidiol while retaining the other beneficial cannabinoids and plant molecules such as CBN, CBC, CBG and CBDv with no detectable THC. Broad Spectrum is an excellent choice for customers who desire the benefits of the “Entourage Effect” but do not want any THC in their product. This is especially beneficial for people who may be subject to testing for THC for work or other requirements. Broad Spectrum oil is used to formulate CBD oil tinctures, CBD vape cartridges, CBD topicals creams and other high quality products. While there are many other factors to consider when choosing your CBD products, hopefully this explanation of the differences between isolate, full spectrum and broad spectrum will provide some insight into which option is the best fit for your individual wellness regimen! Terpenes are a large and diverse class of aromatic organic compounds that are found in the essential oils of plants. The integral role of terpenes in medical cannabis research has led to increased interest and recognition of the potential holistic benefits of these compounds in recent years. The unique scents from these compounds are not only distinctive, but also functional, protecting plants from predators and environmental stressors. Terpenes are produced by many species of plants and even some insects. Conifers (e.g. pine trees) for instance, contain high levels of a-Pinene while citrus usually contains high levels of Limonene. Wine connoisseurs are also known to discuss terpenes as there are over 50 terpene compounds, including Linalool that have been identified in grapes and wine. In cannabis plants, there are over 200 known terpenes, and they are the reason why every strain has a unique smell and different effects. Some of the most interesting and prevalent cannabis terpenes from a wellness perspective are briefly described below. Myrcene, which is also found in mangoes is the most prevalent terpene found in cannabis, especially indica-dominant strains and it is known to promote a sedative, relaxing effect. β-myrcene is also unique in that it crosses the blood-brain barrier, increasing potency and rapid onset of cannabinoids and synergistic terpene action. Beta Caryophyllene is another terpene with unique properties as it is the only non-cannabinoid plant molecule that interacts with the human endocannabinoid system (ECS), illustrating the impact of terpenes on the therapeutic effects of cannabinoids. β–caryophyllene binds to the CB2 receptor found in the central and peripheral nervous system, and is thought to play a major role in managing inflammation .Caryophyllene is prevalent in cannabis plants as well as black pepper, cloves and cinnamon among other species. Pinene has an aroma of pine and firs, with both α-pinene and β-pinene being primary constituents of pine resin. Often used to treat inflammation, α-pinene is the most commonly found terpene throughout nature. Linalool has been isolated from more than 300 different plants and has aromatic undertones of floral and lavender. Users often report calming relaxing effects and it has been used for centuries as a sleep aid. 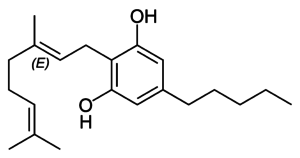 Linalool is also a precursor critical to the production of Vitamin E in plants. Limonene is the primary constituent of fruit rinds, as well peppermint, juniper, rosemary and many pine needle oils. This terpene with it’s citrusy, lemon orange aroma is reported to produce uplifting and mood enhancing effects in users. Limonene is also a natural insecticide to protect plants from predators. Humulene is found in cloves, basil and hops and has an earthy aroma that gives beer its distinctive “hoppy” aroma. One of the distinctive attributes of Humulene is its reported appetite suppression effect. Humulene has been widely used for more than 1,000 years in Chinese medicine. In addition to their own individual holistic effects, terpenes work synergistically with one another as well as cannabinoids like CBD to increase therapeutic potential, modulate efficacy and mitigate unwanted effects, a phenomenon referred to as the “Entourage Effect”. When choosing CBD oil products, terpenes potentially offer a significant improvement in the overall experience for end-users. More research is need to understand the individual effects of terpenes and their synergistic interactions with cannabinoids and other compounds, but the early results are very encouraging for the future of terpene exploration! New study finds CBD can reduce cigarette consumption in tobacco users by 40% in just one week of treatment. Cigarette smoke contains over 4,000 chemicals, including more than 250 known to harm humans. Smoking cigarettes kill more people each year than HIV, illegal drug use, alcohol use, motor vehicle accidents and gun-related incidents combined. 1 out of every 5 deaths in the US is from tobacco. One person dies every six seconds from tobacco. (That’s 10 People per minute). Despite the alarming statistics many people find it difficult or impossible to quit tobacco because of an addiction to nicotine. This is a common condition as nicotine is one of the most addictive substances on the planet and quitting can be a physically and mentally challenging battle for many smokers. A lot of ex-smokers have quit smoking cigarettes recently with the advent of vaporizer technology allowing them to avoid the dangers of burning tobacco without completely quitting nicotine. Unfortunately, these vape pens and devices typically contain “e-juice” that includes nicotine, often in even greater amounts than cigarettes. On top of the nicotine issue, the vaporizers that create the large clouds of smoke that some users enjoy, also raise a lot of potential risks and health concerns of their own. It will be years before there is enough definitive evidence to know if vaping nicotine is actually safer or healthier than smoking cigarettes, but it is definitely more convenient and discreet for many users. Recently, an exciting new alternative has shown tremendous potential to help smokers who want to quit using tobacco and nicotine altogether. The scientific journal Addictive Behaviors recently published clinical trial data containing preliminary results showing that inhalation of the non-psychoactive cannabinoid CBD (cannabidiol) significantly mitigates tobacco smokers’ desire for cigarettes. In the study, 24 cigarette smokers were recruited and split into two groups, receiving inhalers containing CBD or placebo. Both groups were told to use the inhalers whenever they felt the urge to smoke during a one week period. Moreover, participants who used CBD did not report experiencing increased cravings for nicotine during the study’s duration. Most people are unaware that the method by which you choose to ingest CBD can dramatically affect the effective dosage you receive. In general, only a certain percentage of the cannabidiol you consume will be able to enter your system to produce it’s active effects. This is commonly referred to as “bioavailability”. When consumed orally, the typical bioavailability of CBD is roughly 15 percent of the total milligrams consumed. Because CBD is hydrophobic, meaning that it is not very water-soluble, it does not like to stay in the bloodstream, accumulating in fatty tissues instead. This reduces bioavailability. The digestive process known as “first-pass effect” also reduces the concentration of bioactive compounds that can enter the bloodstream after passing through your liver. The most effective way to offset this loss of bioavailability is to avoid the first-pass effect completely and ingest CBD through vaporization. When inhaling CBD from a vaporizer cartridge or CBD vape pen, the substance enters through your lungs and diffuses into your your bloodstream directly, bypassing the liver and gut. This increases amount of CBD in your bloodstream by roughly 400% versus oral consumption to achieve maximum bioavailability of up to 60% of the dosage you consume. This means you can achieve the same beneficial effects with a much smaller amount of cannabidiol. In addition to the increased bioavailability, vaporization also delivers a much faster onset of effects since it does not have to travel through your digestive system. When vaporizing CBD, the effects can become active within a matter of seconds, compared with typical 30 to 60 minute onset when consumed orally. When considering all of these factors, vaporization is clearly the most efficient and cost effective way to consume CBD. When used on a regular basis to mitigate the cravings associated with nicotine addiction, research indicates CBD inhalation offers promising potential for helping people to quit smoking tobacco. HealthSmart CBD offers a line of CBD vape pens and disposable CBD vape cartridges that contain 100% organic ingredients. Without any additives or fillers commonly found in e-juice or vape products like PG (propylene glycol), PEG (polyethylene glycol), VG (vegetable glycerin) or MCT oil, these CBD products are a more health conscious alternative to other means of vaporization. HealthSmart CBD Vape Cartridges contain only CBD concentrate and natural terpenes. Click here to Shop HealthSmart CBD Vape Cartridges now available in 3 varieties: Awake, Calm and Relax.